A generator can be a great tool for a caravanning trip. Provided it is used properly and safely, a leisure generator can provide an effective alternative power supply for electrical items whilst away in the caravan or motorhome. There are lots of generators available, so selecting the right one for your needs is the first step. Some are ideal for supplying power to small appliances, others can act as a backup unit in the even of a power cut or lack of EHU. Certain models which produce pure sine wave power are ideal for powering sensitive equipment such as laptops. However you use your generator whilst on a caravan trip, knowing how to use it properly is vital for the safety of your appliances, your caravan, your family and yourself. A portable generator can be a lifesaver when you’re out on the road, away from an electric hook up on campsite, allowing you to power your microwave, hairdryer, re-charge your phone or laptop etc. However, if not used correctly the same portable generator can become very dangerous. These basic safety guidelines can help you get the most from your portable generator. Petrol engines produce carbon monoxide gas; this gas has no smell and cannot be seen. Carbon Monoxide can kill. Always run your portable generator away from the caravan or motorhome in a well ventilated area. Do not allow the exhaust fumes to be directed towards any windows or doors. Do not use inside the awning. Do not install your portable generator inside a locker – even with an exhaust extension. Portable generators are designed to be used outside and need good ventilation to keep cool. Always use a working CO (Carbon Monoxide) alarm in your caravan or motorhome. Petrol is highly inflammable. Never refuel your generator with the engine running. If you spill petrol, wipe it up and wait for it to dry before starting the generator. Petrol vapour is explosive. Do not store your generator or fuel containers in an internal locker or anywhere that could contain petrol vapour. The risk comes from even the smallest petrol leak or spill which produces petrol vapour. When the vapour given off from the spilt or leaked petrol reaches the right petrol/air mixture, it becomes highly explosive and can be ignited by the smallest spark – i.e. a light switch or cooker switch etc. Petrol vapour is heavier than air so it will accumulate at the bottom of an enclosed area. Always store your generator and fuel in well ventilated areas. The exhaust system can become very hot; avoid touching it. 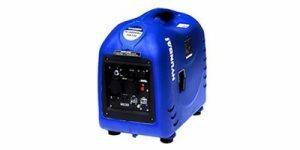 Your portable generator has a power output of 230 volts, the same as mains electricity. Always ensure that the electrical connections are secure, with no exposed wires. Protect you generator from extreme wet weather. Always use an earth spike to ground your generator. 1. When buying a generator, calculate what you need to power from it by adding up the watts for each appliance. It is always advisable to add another 25% to your total to give you a little room for tolerances etc. The problem occurs if you are trying to power an appliance with an electric motor – a fridge or freezer or air compressor for example. The start up current can be 3 or 4 times higher than the running current. So for a 750watt air compressor the start up current could be as high as 3000watts! This only applies to inductive loads such as items with electric motors. Resistive loads like lights, heaters etc do not have increased start up loads. 2. Always use fresh fuel. Modern unleaded fuel has a very short lifespan. 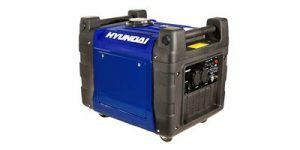 If you are not going to use your generator for over 1 month, it is recommended that you run the generator with the fuel tap off to remove the petrol from the carburetor. If fuel is left in the carburetor, it can cause two problems. Firstly, it will lose its combustion properties and the machine will not start. Secondly, if left for long enough, it can coat the internal parts of the carburetor with varnish-like coating which can block jets or restrict the flow of fuel within the carburetor. 3. Regular servicing – change the engine oil after the first 20 hours, then after every 100 hours. Check engine oil level daily. Use fresh, clean fuel. Change filters every 100 hours. Change spark plug every year. 4. Do not start or stop the generator under load – disconnect all electrical items first. 5. Remember to use your manual. This is a simple but important tip; a manual specific to any generator or machine should be your first port of call for hints, tips and advice on how to properly set up, adjust and use your generator. We take a surprising number of calls from people who don’t read or even keep their manuals, who have thrown away one of the most valuable resources they have when it comes to information on their product. The best inverter generators produce a pure sine wave output that replicates the mains electricity supply and is safe to use with sensitive items like PCs etc. Other features to look out for include wheel kits for easy movement, and electric start. This is becoming increasingly popular, especially with the more senior user. Remote start generators are also now available, so you don’t even have to leave your caravan or motorhome! This article was kindly written for Caravan Talk by Genpower UK Ltd.